We are forced to wonder if this magnificent art must have been carried through trauma to reach the ultimate seat of grace. The deepest felt films are often the most harrowing. 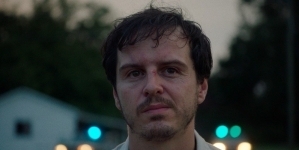 In Tree of Life (2011) Terrence Malick examined the constant conflict of grace versus nature. Do we follow the way of grace and tap into inner strength and kindness, even when faced with loss or the cruelness of the world? Or do we follow the path of nature and recognize that the world exists as it is and that we simply must be in the face of destruction, genocide and pestilence? In many ways Andrei Rublev (1966) echoes and examines the space between these divergent ways of viewing life. 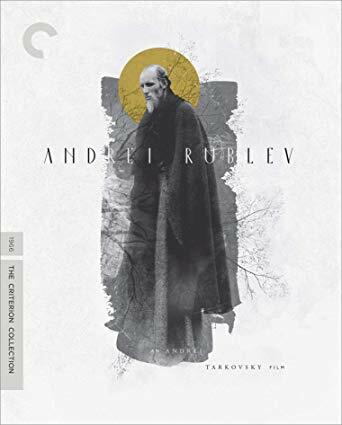 Andrei Tarkovsky’s second film follows the mostly fictionalized journeys of the eponymous Andrei Rublev, a 15th century icon painter whose work the Orthodox Church would later lionize following his death, eventually canonizing the monk as a saint in 1988. 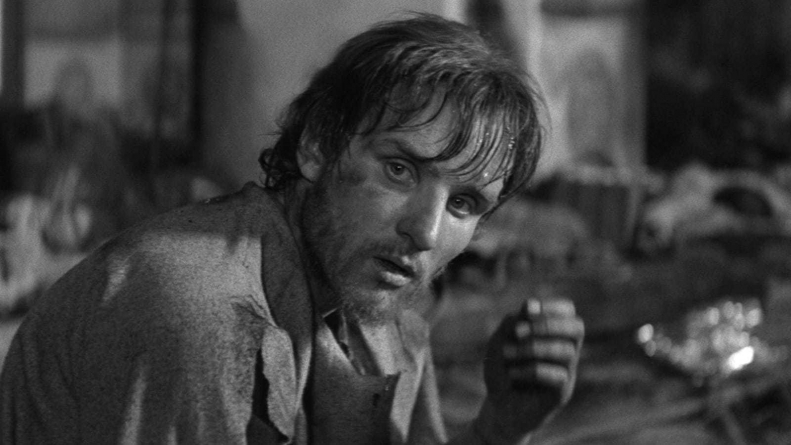 Played by Tarkovsky regular Anatoly Solotnitsyn, Andrei Rublev spends the three-hour runtime wandering a desolate and violent Russian landscape where he observes miracles and horrors, all the while trying to maintain his artistic and spiritual honesty. The film begins with an unexplained prologue where a man escapes from an angry mob in a makeshift hot balloon, soaring above the earth before crashing to his death, exuberantly shouting, “I’m flying.” Maybe this little vignette is a cautionary tale, much like what happens to poor Icarus. However, this is a great example of grace versus nature. The flyer is escaping a guaranteed death at the hands of another human by floating away, yet even in his final moments, he recognizes a beauty while being airborne. Tarkovsky never returns to this character nor mentions his demise but this is the perfect introduction to the hallucinatory world he conjures in Andrei Rublev. When we first meet Andrei, he is traveling across Russia, going from cathedral to cathedral in search of places to paint. Along for the journey are two other monks, Kiril (Ivan Lapikov) and Daniil (Nikolai Grinko), older colleagues who seem wearier and warier than the young monk they accompany. One grouses about leaving the sanctuary of their monastery but Andrei does not share these fears. Naïveté and idealism still bristle through this young man, notions that will be sorely challenged over the course of the movie. Andrei’s companions have good reason to be afraid. During this epoch, Russia suffered invasion from the Tatars, a violent, nomadic Mongolic group that raided villages, burned churches and murdered townspeople. Tarkovsky frames this period as a bleak quagmire of destroyed villages, razed forests and smoldering churches. It is a time of madness and murder. The monks try to find solace in the various cathedrals, hoping to tap into some hidden vein of grace and using the art as a way to block out the horror that is taking place just outside. Unfortunately, Tarkovsky soon shows us that no one is safe from the malignant violence that is devouring Russia. Tarkovsky punctuates the film with moments of shocking violence. Towards the middle he stages the violent sack of the village of Vladimir by a mob of Tatars. Similar to the way Kurosawa would stage similar large-scale visions of slaughter in Ran, Tarkovsky thrusts us into the brutal massacre where monks and townspeople are killed and women are dragged off and raped. Andrei is one of the only people to survive the pogrom, breaking his vows and murdering a Tatar in the process. Devastated and forlorn, Andrei finally crumbles and swears to not only cease speaking, but also quit painting as well. So what’s the alternative? The Orthodox Church depicted in Andrei Rublev offers no antidote of joy for the revulsions of this awful world. It is a stringent, dogmatic vision which constantly keeps Andrei questioning his place in the order of things. In one of the most stunning scenes, the monk happens upon the naked bacchanalia of pagans celebrating in orgiastic delight. When he expresses his dismay, the pagans tie him to a cross, leading the monk to beg them to at least tie him upside down. Does Andrei Rublev sacrifice grace and succumb to the ways of nature? Not exactly. Tarkovsky frames his protagonist in an almost saintly light, depicting him in ways that echo the religious icons he has painted. We never actually see Andrei paint anything yet this is a film about the role of grace an artist must possess. Espousing holy mantras or making small gestures really isn’t enough to inhabit the idea of grace. Andrei Rublev, instead, must pass through hell to recognize his role in the creation of something truly divine. In the final 10 minutes of the film, Tarkovsky switches from black and white to color, passing his camera over the real-life work of Andrei Rublev. 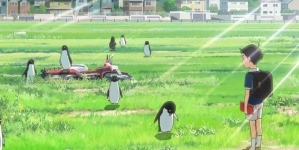 As the camera pans over the ecstatic and vibrant icons, we are forced to wonder if this magnificent art must have been carried through trauma to reach the ultimate seat of grace that the director has presented us at the end of a very difficult three hours.